Treasure Hill Artist Village, located near the Gongguan campus of National Taiwan University in Wen-Ro-Ting region, is hidden amidst Xiao Guan Ying Mountain on Tingzhou Road, as if a parallel universe isolated from the prosperous metropolis. When visitors come to Treasure Hill Artist Village, they may dwell in Attic Hostel at the end of the village. 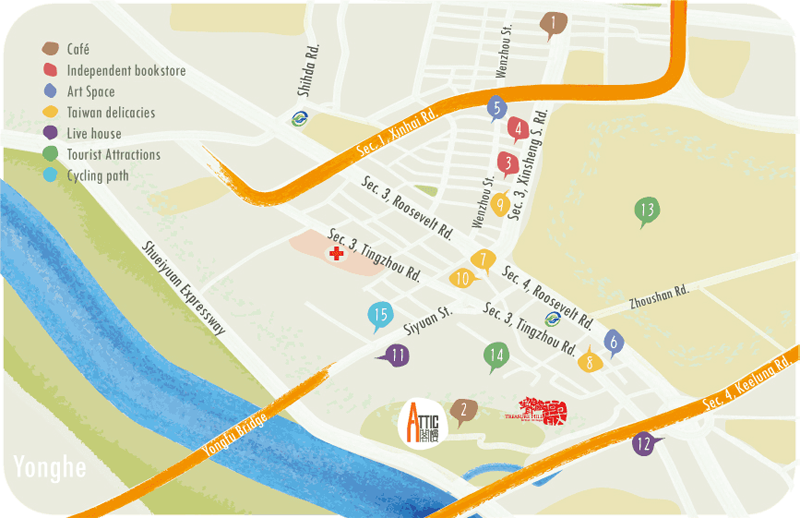 Not only to enjoy a quiet moment rarely found in the noisy cities, but also find the beauty and unique charm in the blocks formed by Wenzhou Street, Roosevelt Road, and Tingzhou Road (Wen-Luo-Ting Region) when walking down the path. Independent bookstores, coffee shops, movie theaters, live houses, all kinds of delicacies, and campus with ancient history along with vitality of young students, make Wen-Luo-Ting region become a cultural and lively area. Biking by the riverside and Water Park, or stroll on Xiao Guan Ying Mountain and the Toad Mountain nearby, you can get closer to the nature of Gongguan area. Start out from Attic Hostel, enjoy a short trip to Wen-Luo-Ting and Gongguan region! Wistaria Tea House is a place full of beauty and vitality, full of contradiction and experiment. The former tenant, Professor David Chow, introduced Western liberalism into Taiwan during the 1950s, transforming the house into a place for critical debate. After the "Formosa Incident" in 1979 (the brutal crackdown of Taiwan's rising democratic movement), Wistaria Tea House became the meeting place for political dissenters and a new generation of artists. Located inside Treasure Hill Artist Village, Tadpole point is a lounge room and dining place for visitors and artists. When they come here, it feels like visiting a friend's house. Besides coffee and beverages, Tadpole point also serves light meals and changes the ingredients according to the season. The cafe also holds all kinds of small performances and independent filmmaker exhibitions every month. Fembooks, the first feminist bookstore in Chinese community, was established on April 17, 1994, mainly by a group of activists and supporters of the Awakening Foundation, the first women's movement organization in Taiwan. fembooks sells books by women, about women and for women with a huge variety of topics such as autobiographies, theories of women's/gender studies, sexualities, art, novels, poetry and so on. Besides selling and publishing books, fembooks is holding all kinds of activities year round. "Taiuan-e-tiam Booksotre" is a local cultural bookstore, providing books, music, film, images, and souvenirs regarding Taiwan research and local awareness. It was founded by Wu Cheng-Shan and Huang Miao-Ling in March 1993 at the current address. "Taiuan-e-tiam" is pronounced in Taiwanese, which means "Taiwan's store." Hidden on the second floor of a residence on Wenzhou Street, you have to ring the doorbell to get in m!m!, this makes the space more private and fun. mi!mi is an exhibition space with a mini bar and a kitchen. Their lovely staff and cozy space will make you feel like home. Occasionally, you can meet some artists and interact with them. mi!mi not only holds exhibitions but also publishes books and magazines, you could find their latest information on their Facebook page. The Cube was founded in an old building with more than 40-year history in April, 2010. It was formerly an old hotel. The Cube set up the goal to promote contemporary art, profound humanity, connect international art networks, and promote art history. An art space is provided for art lovers in Taipei to display, hold seminars, and exchange ideas. It continues to bring in excellent contemporary artists and invite culture-related figures to hold forums. Gua Bao is a traditional Taiwanese snack made of a sliced hot steam bum with braised pork and parsley, peanut powder, and sauerkraut, which you cannot miss. Lan Jia Gua Bao is located in the prosperous section of Gongguan and has always been the favorite snack of NTU students. It has years of history and a unique taste. Besides Gua Bao, Shi Shen Soup with Chinese medicine is one of the delicious foods visitors must taste. Shuiyuan Market was built in 1953. The first and second floors have more than a hundred booths selling all kinds of gourmet, grocery and fresh produce. On the first floor, snack booths with fair prices stand by one another, attracting countless students and visitors. Meat and seafood booths are on the second floor as well as tailor shops and daily necessities. In 2012, the Ministry of Culture invited famous artist Yaacov Agam to create a large public art, "The Heart of Shuiyuan", which lights up the old market with its colorful and geometric structure. Tai Yi Milk King is an old dessert store across NTU. It has years of history and is a wonderful memory for many NTU students. During summer, Tai Yi serves all kinds of shaved ices, ice cream, and juice. In winter, it serves Azuki red bean soup and peanut soup. Red bean and sesame rice balls and brewed wine rice balls are the two delicious desserts you must try. Chen San Ding Bubble Milk Tea has its tapioca cooked just right, matching with brown sugar syrup and milk, makes perfect bubble milk tea. With people keep coming, it has become a popular delicacy in Gongguan district. It also serves lemon with aiyu jelly, mung beans, and Chinese mesona. PIPE Live Music, adjacent to the Water Park, was a pumping station and a centennial historical site with a hundred-year history. Abundant programs are the biggest feature of PIPE. Besides music events, it also holds parties, seminars, and exhibitions. THE WALL MUSIC was founded in 2003. At first, it was only an adventurous gamble by a few individuals who really cared about music, but now it has grown to become a major cultural force throughout Taiwan. Now having established top quality live houses in Taipei, Kaohsiung and Ilan, The WALL also holds exciting music festivals, such as Formoz Festival and Mega Port Festival. National Taiwan University, also known as NTU, is the oldest university in Taiwan. It was founded in 1928 and famous for its liberal atmosphere. Entering NTU campus from Roosevelt Road and Xinshen S. Road, you will pass by a boulevard lined up with coconut trees. At the end of the boulevard is the new library of NTU, which inherited Japanese style and has become significant landmark of the campus. The new building of the College of Social Science, completed in 2013, was designed by the award winner of the Pritzker Architecture Prize, Toyo Ito, and was approved as the first public art building by the Ministry of Culture. These make the NTU campus a place with abundant natural scenery and cultural significance. Taipei Water Park is located on Siyuan Road, beside Yongfu Bridge. It has an area of 17 hectares. The park has many theme areas related to water resources, Water country park, Kuanying hill hiking area, Museum of drinking water, Aqua friendly experiencing area, Historical Water Metering Room Plaza, Water Resources Education Hall. People can learn much diverse information about water. It is also a good place to go for field trips. In period other than Summer Period: 9:00-18:00 pm (tickets offer till 5:00 pm). Monday is the day off, but if Monday falls into continuous holiday, it is still open to the public. Water Park cycling path starts from Tingzhou Road and Siyuan Street, surrounding the Water Park. It is 750 meters long, connecting the NTU campus, Gongguan Shopping District, Shuiyuan Tourism Theater, Taipei Artist Village, Water Park, and Riverside Park. It also connects the cycling path of Xindian Riverbank, northbound to Guandu and southbound to Jinmei. People can rent a bike at MRT Gongguan Station or Jinfu Bike Station.